Do you need to be able to secure your partners hands behind their back? Or attach your baby in a specific position without having to take out ropes? Yes? Then this double carabineer is just the thing for you. 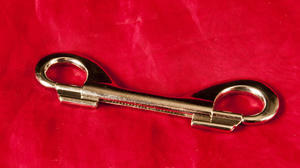 Chambers of loves won double carabineer is discreetly engraved with our own logo and has a soft spring when you open it.